A white block with black ♩ on its sides. A Note Block (originally Jump Block) is a type of bouncy block that helps Mario and Luigi achieve extremely high jumps. They first appeared in Super Mario Bros. 3, then in Super Mario World. In Super Mario Bros. 3, the Note Blocks can be used to jump high (by pressing the jump button as the player is launched upward) and occasionally hold a power-up for the player if he or she bounces on it or hits it like a ? Block. Also in Super Mario Bros. 3, there is a special variety of salmon-colored Note Blocks called Magic Note Blocks hidden in some courses that catapult Mario or Luigi to Coin Heaven, where many coins and a 1-Up Mushroom could be found. Two of the e-Reader card levels in the GBA remake consist entirely of Note Blocks: 06: Magical Note Blocks and 11: A Musical Trek. Note Blocks reappear in Super Mario World, and behave the same as in the predecessor. In New Super Mario Bros. Wii, Jump Blocks are redesigned with a white-green checkered pattern, although they act the same. These checkered blocks are uncommon and can be found in stages such as World 7-5, Lakitu Enemy Courses, and in Iggy's castle. Note Blocks later appear in Super Mario 3D Land (making their first appearance in a 3D Mario platformer game), where they serve the same purpose. However, they retain their original designs, and most of them are two blocks wide (though in the box art and in certain courses, they retain their earlier proportions). They also make musical sounds and notes appear when they are jumped on; in a pre-release trailer, they can be heard making the "zip-zoo" noise Yoshi makes when mounted, but this was removed from the final game. As of this game, Note Blocks do not hold power-ups. Magic Note Blocks return and are renamed "Super Note Blocks"; they once again send Mario to a Coin Heaven area, but now are twice as long, flash colors, and have a white note on their sides. Note Blocks also appear in New Super Mario Bros. 2. Here, they all retain their appearance from most other 2D platformers. However, the musical notes and sounds (now based on the chords of the game's music) return from Super Mario 3D Land. Note Blocks later appear in New Super Mario Bros. U. They behave mainly the same, except they now play a fixed note when bounced on. Note Blocks return in Super Mario Maker and Super Mario Maker for Nintendo 3DS, where they can be used in all four styles. While it retains its appearances in Super Mario Bros. 3, Super Mario World and New Super Mario Bros. U, it features a new sprite for its Super Mario Bros. appearance. 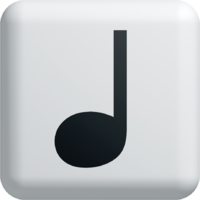 Pink versions called Music Blocks also appear, using an ♪ instead of a ♩. Although they function like normal Note Blocks, they also play a sound with its pitch based on the block's height, and its instrument based on what object/enemy bounces on it, but specifically plays a steel drum if Mario bounces on it. These blocks also appear in the TV series, The Adventures of Super Mario Bros. 3, where some have a ♫ instead of a ♩. In Mario & Wario, they look and act more like springboards. They do not have their musical note as in other games, nor are they often suspended in midair. Note Blocks are in the Mario Party 5 minigame Bound of Music, where each player has to jump and hit the most Note Blocks. However, the Note Blocks are invisible. In Mario Party 9, the New Super Mario Bros. Wii design appears in the Upward Mobility minigame. In Mario Party: Island Tour, Note Blocks return with their New Super Mario Bros. Wii design in the minigame Trounce 'n' Bounce. In Mario Party 10 Note Blocks with their original design appear in the minigame Bouncy Bounty. Note Blocks also appear in Mario Superstar Baseball, in the Peach's Castle field. If a baseball bounces on top of it, the batter may score a homerun. Note Blocks appear in Music Park in Mario Kart 7, Mario Kart 8 and Mario Kart 8 Deluxe—however, they are unreachable and simply decoration. Note Blocks appear in Mario Golf: World Tour as usable item shots. It causes a Note Block to appear during the ball's course, causing it to fly high into the air over obstacles or with increased shot distance. In Super Smash Bros. for Nintendo 3DS and Super Smash Bros. Ultimate, a Note Block appears on the 3D Land stage, having the same function as in the Super Mario games. In Mario & Luigi: Paper Jam, when Mario, Luigi, and Paper Mario are rescuing Paper Toads in Sunbeam Plains in the mission Paper Toad Rescue, a row of five Note Blocks can be found. A purple Paper Toad can be found jumping on the blocks, and he can be rescued by hitting one of the blocks while he is on it. Another Note Block can be found in the mission Fly Guy Flyby, where it can be found behind a crack that only Paper Mario can fit in. A Fly Guy holding a Paper Toad can be found above it, and hitting the Note Block causes the Fly Guy to fly away. In the mission Paper Toad Shuffle, two more groups of Note Blocks can be found, each with a purple Paper Toad jumping on them. Notes Block. Pun on "Bloco de Notas" (notebook). In the Super Mario Mash-Up Pack in Minecraft, the traditional Note Blocks take on their look from the Mario titles. ↑ Super Mario Bros. 3 English instruction booklet, page 17. ↑ Nintendo. (August 12, 2015). Wii U - Let's Watch! Super Mario Maker Overview!. YouTube. Retrieved August 12, 2015. ↑ Super Mario Bros. 3 Japanese instruction booklet, page 16. ↑ Shogakukan. 2015. Super Mario Bros. Hyakka: Nintendo Kōshiki Guidebook, New Super Mario Bros. Wii section, page 150. This page was last edited on April 18, 2019, at 13:33.